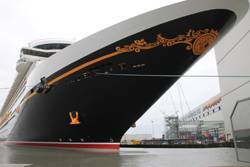 Disney Fantasy was delivered by Germany's Meyer Werft, the "Cradle of Cruise Ships." These are the pictures which are going around the world on the occasion of towing again an enormous cruise ship out of the covered building docks and pull it in high precision work via the very narrow inland waterway across the grassland of the river Ems towards the open ocean. These pictures brings the city of Papenburg, with its 35.000 residents, into focus. The pictures are unreal as well as fascinating. With its periodical rerun, always then, when a new cruise ship leaves the Meyer Werft of Papenburg, they are burnt into the memory as a kind of an icon of the new ultra-modern Northwest. Who are the people of the Meyer Werft and what makes them so effective? The company Meyer Werft GmbH in Papenburg on the river Ems was founded in 1795, and has been owned by the Meyer family for six generations. Bernard Meyer is managing partner at the helm of this well-established shipyard. The president likes it to be reserved. He wears a dark blue jacket, typical east Frisian, he drinks tea and drives an Audi. But not an eye-catching one. Don’t make a great play – particularly of one’s own. Only the maritime golden button on his jacket twinkle a bit treasonous. Over the past few decades Meyer Werft has earned an excellent reputation in the construction of special-purpose ships – and this throughout the world. Long-standing experience in the construction of passenger vessels gained in the 80s has been the basis for a successful entry to the market of large, modern cruise ships. To date the shipyard has delivered 32 luxury liners of different tonnages to customers all over the world. The latest highlight was the delivery of the 122,000-gt giant Celebrity Silhoutte to Celebrity Cruises (Miami) in July 2011 in Eemshaven/Netherland. The Celebrity Silhoutte is the fourth ship out of a series of five cruise ships the shipyard is building for Celebrity Cruises. Highly energy-efficient systems, a solar power system, optimized hydrodynamics, a very efficient underwater hull coating and an energy-saving lighting system using LEDs cuts back the ship‘s energy demand considerably. Very soon the next transfer and delivery was in preparation: Mid January 2012 the Disney Fantasy leaves the covered building docks and end of the month the new luxury cruise liner went on his very difficult delivery voyage via the Ems towards the Northsea for several day’s seatrails. Meanwhile, the Meyer Crew assembles the next cruise liner – the AIDAmar. Delivery has been scheduled for Q2 2012. Today, with its approx. 2,500 employees, Meyer Werft is one of the biggest employers in the region. In the family-owned company more than 300 apprentices are trained in 12 different professions. Over and above this enterprise cooperates with about 2,000 suppliers, which ensures employment in regional companies and beyond. Meyer Werft has always proven to be extremely creative when it comes to outfitting of their luxury liners: climbing walls on sundecks, golf simulators, Broadway-style theatres or ultramodern beauty and spa areas make holiday dreams come true. This well-established company has meanwhile developed into Germany’s biggest contractor for theatres. Moreover, with its green ship concept, the shipyard has been pursuing a lasting strategy for improving the eco-friendliness of cruise ships. This concept embraces reduced emissions and energy consumption, environmentally friendly water and sewage treatment as well as non-polluting waste disposal. Luxury car and passenger ferries as well as RoRo ferries and passenger ships also count among the shipyard’s range of products. Over the past few decades Meyer Werft has built 30 ferries and RoRo ships. Neptun Werft GmbH with it’s headquarter in Rostock , is a builder, among others, of river cruise ships which are operated on the Danube and the Rhône, for instance. Neptun Werft currently has ships on order, or under construction respectively, for the river cruise operators A-ROSA Flussschiff GmbH, Rostock/Germany and Viking Croisière S.A., Basel, Switzerland. In April of the past year 2011, Neptun delivered the river cruiser A-Rosa Brava and in same years July the Viking Prestige to it’s client. Since 1983 Meyer Werft has also built 24 passenger ships for the Republic of Indonesia. The latest ship was the Gunung Dempo which the shipyard delivered to the Indonesian owners in June 2008. Meyer Werft is also focusing on the construction of gas tankers for the transportation of liquefied and chemical gases. In 2010 the 55th gas tanker was completed and delivered to the owner by the Papenburg shipbuilders. And last but not least: After designing a new prototype at the computer the innovative newbuild begins to take shape: The steel cutting of the first LNG carrier with a so-called dual-fuel engine for shipping company Anthony Veder (Rotterdam/NL) marks a new era. The new tanker for the transport of Liquefied Natural Gas will have a length overall of about 156 m, a breadth of 22.7 m and a cargo capacity of 15,600 cu. m., which can be cooled down to minus 164° C. The ship, which will be named Coral Energy, is able to operate at a speed of 15.8 knots and can be powered by LNG as well as heavy fuel oil. The delivery of the vessel is scheduled for Q4 2012. Neptun Werft will be highly involved in the construction and outfitting of this new LNG carrier. In 1975 the shipyard moved its premises from the town center to the periphery of Papenburg, where first of all a covered building dock was built, which was extended between 1987 and 1990. To meet the strong demand for newbuildings, Meyer Werft made the biggest investment in the history of the company in 2002: a second building dock and prefabrication halls featuring state-of-the-art laser welding plants were built. The new building dock was once again extended by 120 m in 2008. Currently the laser welding plant undergoes a lenght extension. In doing so, Meyer Werft has provided the best possible conditions in order to stand its ground successfully in the fierce international competition also in the future, and to be able to offer ships of all customary tonnages (up to 180,000 gt). The construction of cruise ships is a highly competitive market, with much international competition. Two years ago, Meyer Werft began to restructure its strategy, with the aim of consolidating the company’s market position. Also, the new concept “Continuous Improvement Process” (CIP) is being gradually implemented throughout the shipyard’s various sections, in the form of a continuous improvement process. By analyzing individual processes, streamlining methods can be determined and implemented, with the aim of increasing efficiency, reducing cost, improving quality, and shortening ship throughput times. The Streamlined Shipbuilding system also necessitates streamlining of the logistics processes in the company. All changes are based on the “6 Rs” of logistics: the right goods at the right time, at the right place in the right volume, in the right quality and at the right cost. The ship development process has been implemented in the shipyard’s design and construction offices, to ensure that the work process is as productive and timesaving as it can be, even during a ship’s development phase. It also enables the needs of the production process to be accommodated as early as possible. The purchasing department subjected itself to a process analysis at the beginning of the year, in which two essential improvement methods were established. Ralf Sempf explaines the system: “First of all, we need to integrate partner companies in a cruise ship’s design process at an earlier point in the process. This enables the supplier to devise plans for the various sections of the cruise ship in the early phase of the project, in consultation with the customer and the Meyer Werft design and construction office. Our partners are then better able to plan, to detect implementation problems at an early stage, and to develop alternative strategies. The first five pilot sections have already been defined for the new Norwegian Cruise Line ships. Secondly, we not only wish to optimize the shipyard’s processes, but also to promote the continuous improvement process together with our strategic partners.